(Butter and Eggs (Linaria vulgaris) - 01) While on one of our walks, we spotted this small patch of butter-and-eggs wildflowers growing among other plants. 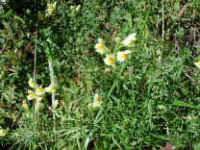 Apparently due to the competition for space, the stems of these butter-and-eggs wildflowers only developed a few flowers. 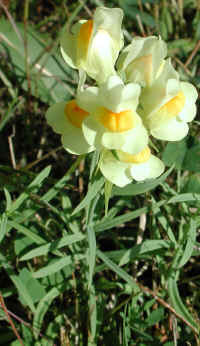 Where they can grow "freely", the butter-and-eggs will produce fifteen or more blooms on each stem. 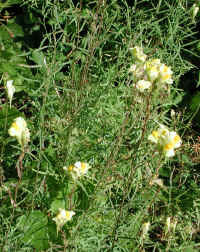 The butter-and-eggs, a member of the Figwort family, usually grow to heights of one to two feet. (Butter and Eggs (Linaria vulgaris) - 04) This is a closer view of one of the butter-and-eggs stems, which looks like it will develop several more flowers lower on the stem. The literature states that the butter-and-eggs blooms from May through October, but we didn't spot these until September. There is only one species of butter-and-eggs which grows all across the northern two-thirds of the United States, though it is more prevalent in the eastern states. 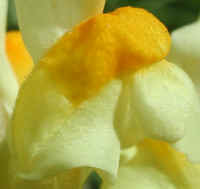 One of the interesting features of the butter-and-eggs is the closed throat of the flowers which extends below the stem and calyx, and which are clearly visible on the lower two blooms. (Butter and Eggs (Linaria vulgaris) - 02) The butter-and-eggs, a native of Europe, was introduced into North America by the early settlers because of its many uses: as an ingredient in colonial skin lotion, as a tea made from its leaves to treat constipation (which they most likely would not have suffered from if they had been totally vegetarian), and its juice, mixed with milk, was used as a fly poison around barns. (Butter and Eggs (Linaria vulgaris) - 02a) This is an enlargement of the previous butter-and-eggs photo to more clearly show the opening bud at the top of the stem, the way the stem and calyx attach to the "middle part" of the flower (middle flower), and the closed throat of the flower extending below the calyx (lower flower). 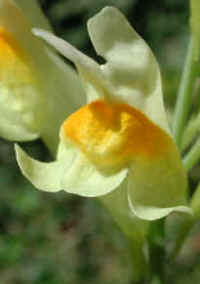 The closed throat is formed by the lower lip of this 2-lipped flower. 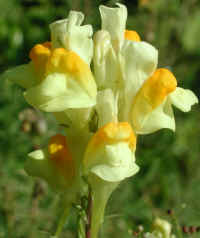 (Butter and Eggs (Linaria vulgaris) - 03) The actual size of the butter-and-eggs flower is about one inch long from the top of the upper lip to the bottom of the closed throat, or about one-thirteenth the size of this full-sized photo. 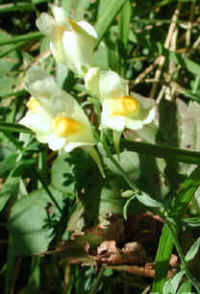 The flower of the butter-and-eggs is formed by a 2-lipped corolla which is spurred at the base. The upper lip has two lobes which stand erect. The lower lip has three lobes with an orange colored base which close the throat. The butter-and-eggs, at close inspection, seems to have a hairy "tongue" resting on the top of the lower lip. We find ourselves constantly thanking God for little wonders, such as the butter-and-eggs, which bring joy to our souls. Let us work together to protect and preserve all that God has given us. (Butter and Eggs (Linaria vulgaris) - 05) As we were taking one of our walks, we came upon another small patch of butter and eggs. God's creation is filled with never ending beauty, if we will only take the time to see it; and we can see it during every season of the year. The butter and eggs are just one of the beauty "spots" which appear from late spring to early fall. (Butter and Eggs (Linaria vulgaris) - 05a) The broken, decomposing tree branch adds an interesting contrast to these butter and eggs that were growing on the edge of a field beside the road. 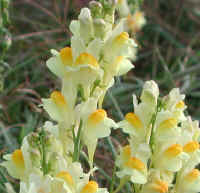 (Butter and Eggs (Linaria vulgaris) - 06) This is a closer look at one of the butter and eggs flower clusters. (Butter and Eggs (Linaria vulgaris) - 06a) One of the things we really enjoy about doing macro digital photography is that we get to see parts of God's creation that we couldn't see with the "naked eye". In this close-up of a single butter and eggs flower, we can see the hairy yellow tongue and the individual cells that form the petals. (Butter and Eggs (Linaria vulgaris) - 07) This normal view of a patch of butter and eggs is in sharp contrast to the close-up view of macro photography. Both views have their own beauty, if we just take the time to see all that God has unfolded before us. 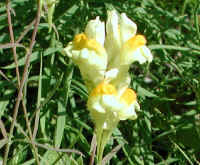 (Butter and Eggs (Linaria vulgaris) - 08) Before continuing on our walk, we took one last look and photo of a butter and egg flower cluster. When we learn to truly cherish every aspect of God's creation, and not destroy it, we will discover the true meaning of peace. 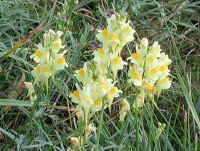 (Butter and Eggs (Linaria vulgaris) - 09) These butter and eggs were growing in a grassy field. They were quite short, which according to our observations, appears to be a common trait of wildflowers that grow in places where they are mowed. When mowed down, they seem to be genetically programmed to bloom rapidly without reaching full height, as a means of preserving the species. 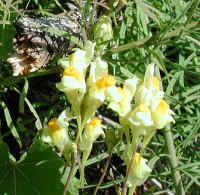 (Butter and Eggs (Linaria vulgaris) - 10) At the top of this photo, the lower flowers on two butter and eggs are already withering and going to seed, while others are in full bloom. 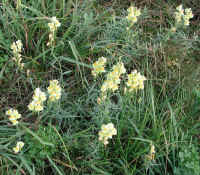 (Butter and Eggs (Linaria vulgaris) - 10a) This is another cluster of butter and eggs that were growing in the field. 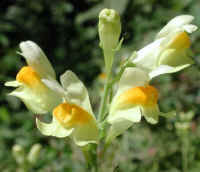 (Butter and Eggs (Linaria vulgaris) - 11) The flowering racemes of the butter and eggs develop from the ground upward with the first flowers appearing at the bottom while buds are still forming at the top. This gives the lower flowers a chance to go to seed, in case the raceme is cut before it has fully developed. 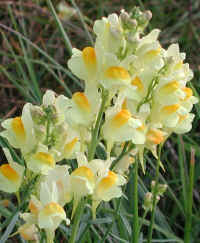 (Butter and Eggs (Linaria vulgaris) - 12) This is another natural bouquet of butter and eggs that was growing in the field. A newly developing raceme can be seen at the bottom right of the photo. 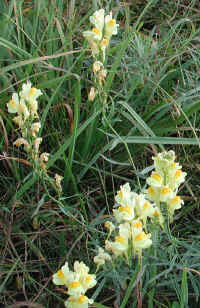 (Butter and Eggs (Linaria vulgaris) - 13) In this photo of the butter and eggs, we can observe the linear "grass-like" leaves. 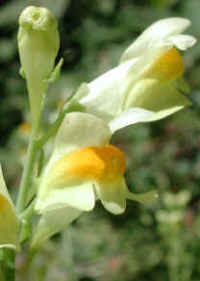 The lower leaves grow opposite or whorled, while those higher on the stem grow alternately.